The day finally had arrived. Everything had gone perfectly for Orb and trainer Shug McGaughey. So perfectly in fact that one couldn’t help but feel there were forces guiding the colt every step of the way, from the early days this winter at Payson Park to his breakout performances in the Fountain of Youth Stakes (gr. II) and Florida Derby (gr. I). With every breeze, every gallop, and every race, the son of Malibu Moon – Lady Liberty, by Unbridled became stronger, constantly moving forward both mentally and physically. As each obstacle was cleared, such as the colt’s final work and the dreaded post position draw, McGaughey grew more outwardly confident and excited, which in some ways seemed out of character for the usually taciturn trainer, who keeps his emotions in check and lets his horses do all the talking. Well, Orb was doing a lot of shouting and the Kentucky-born McGaughey couldn’t help but feel his life-long dream of grabbing the coveted roses was about to come true. 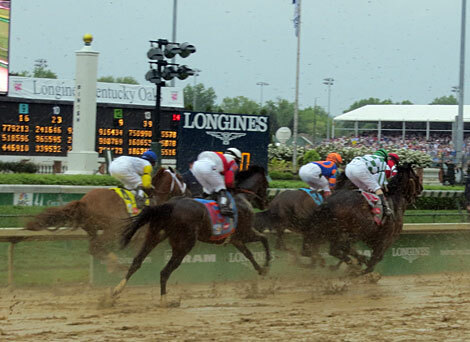 While all the Derby starters remained in their respective barns on a damp overcast Derby morning, with steady rains approaching quickly, two lone figures made their way in the darkness toward the track at 5:45. Orb stood calmly with exercise rider Jen Patterson aboard, as McGaughey leaned against the rail and took one final look at the colt before having him jog once around. Some 12 hours later, Orb, with Joel Rosario up, came charging through the slop from 17th in the 19-horse field to win the $2,174,800 Kentucky Derby Presented by Yum! Brands (gr. I) by 2 1/2 lengths as the $5.40-1 favorite. The Derby gods had indeed worked their magic. Despite the deep, talented field that had assembled for the 139th Derby, this was the year when McGaughey and the Janney and Phipps families were destined to restore the Sport of Kings to the way it was and the way it was meant to be, when true sportsmen and their private stables and homebred Thoroughbreds ruled the Turf. Turn the clocks back to 1988. As the field swept around the far turn of the Gotham Stakes (gr. II), two horses came charging up to the leaders eyeball to eyeball, moving as a team. 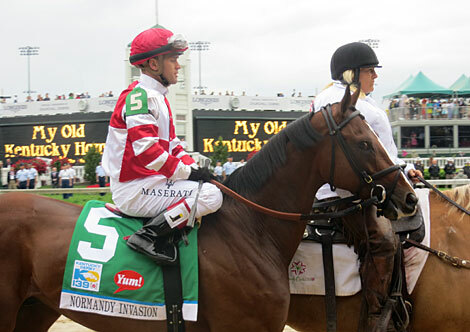 In the red and white silks of Stuart Janney Jr. was the 10-1 Maryland invader Private Terms, trained by Charlie Hadry. Right alongside him, matching stride for stride, was the 3-5 favorite Seeking the Gold, trained by Shug McGaughey, in the familiar black silks and cherry red cap of Ogden Phipps. The undefeated Private Terms began separating himself from Seeking the Gold, opening a two-length lead at the eighth pole. But the Phipps colt came back at him, falling three-quarters of a length short. Both colts would meet again two weeks later in the Wood Memorial, with Private Terms again defeating Seeking the Gold, this time by 1 1/2 lengths in stakes-record time. Their rivalry would continue in the Kentucky Derby, won by Winning Colors, and come to a conclusion in the Haskell Invitational (gr. I), with Seeking the Gold getting beat a nose by Claiborne Farm’s Forty Niner in an epic stretch duel, as Private Terms narrowly missed third by a half-length. In September of that year, Stuart Janney Jr., who had been married to Ogden Phipps’ sister, Barbara Phipps Janney before her death the previous year, was killed in an automobile accident at age 81, suffering a heart attack while driving to his home at Locust Hill Farm in Glyndon, Md. The Janney stable, which had reached its apex in 1975 with the legendary ill-fated Ruffian, eventually was taken over by Janney’s son, Stuart Janney III. In 2002, Ogden Phipps died, with his son Ogden Mills, better known as Dinny, becoming patriarch of the longtime racing dynasty. It has been 25 years since the two families clashed in those memorable 1-2 finishes in the Gotham and Wood Memorial. Still looking for their first Kentucky Derby victory after so few attempts over the years, the Janneys and Phippses joined forces, racing as partners in a well-bred Malibu Moon colt named Orb, who they also bred in partnership, although Dinny now kids how he didn’t like Orb’s dam, Lady Liberty, and tried to persuade his cousin to sell her. “But he outsmarted me and bred her to Malibu Moon and here I am,” Dinny said. The fourth dam of Orb, is Laughter, who is by the Phipps family’s great racehorse and stallion Bold Ruler, out of Ruffian’s dam, Shenanigans, so this racing and breeding partnership goes back five generations. To come up with a horse like Orb, they reached into the pedigrees and descendants of racing titans Damascus and Dr. Fager, who were involved in the epic 1967 Woodward Stakes showdown with Ogden Phipps’ mighty Buckpasser. 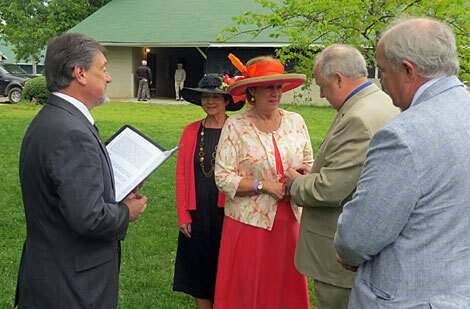 It seemed as if the Derby gods or whatever other-worldly entity you care to attribute it to had finally found the perfect year to reward not only two long-established families, but the Sport of Kings itself. This was Thoroughbred racing at its purest, with the blood of champions being regenerated through the decades to give the sport a sense of continuity, while serving as a reminder of where it came from. The Phipps family in particular is the last of a dying breed of sportsmen who built a foundation strong enough to withstand the passage of time and an ever-changing world, where tradition and sportsmanship have been eroding with each passing year. McGaughey, the Phippses, and Janney are the last remaining pillars of strength, and as long as their familiar silks continue to adorn horses like Orb, those pillars will never crumble. Ogden Phipps must have felt a Kentucky Derby victory was imminent after his 30-1 shot Dapper Dan’s powerful stretch run in 1965 fell a neck short of catching the fully extended winner Lucky Debonair. But Ogden Phipps would have only two more Derby starters over the next 37 years – Seeking the Gold in 1988 and Easy Goer in 1989. Dinny would run only one – Awe Inspiring in 1989; and his daughter, Cynthia, racing in her grandmother’s Wheatley Stable colors, would have only one – Saarland in 2002. Wheatley Stable, owned by Mrs. Henry Carnegie Phipps, had attempted the Derby seven times from 1928 to 1967, but never even finished in the money, despite being represented by champions Bold Ruler, Bold Lad, and Successor. The Phippses have always been known for their longevity in keeping trainers and not interfering in racing decisions, which is another aspect of the sport that has changed dramatically. McGaughey has been their trainer for 27 years through both prosperous and lean years. The old school operation goes beyond McGaughey and the well-bred horses right down to the help, most of whom have been with McGaughey for 25 to 30 years. McGaughey and his main assistant, Buzzy Tenney, have known each other since elementary school and were in the Cub Scouts together in the same den. When McGaughey took over as trainer for the Phipps family in 1985 he asked his old friend, who had been working for trainer Steve Penrod in Aiken, S.C. to come work for him. In 1989, it looked as if the Phipps family and McGaughey had found the ultimate racehorse they had been seeking for so many years. If any horse was going to give them their first Kentucky Derby victory it was Easy Goer, a chestnut Adonis that appeared to have everything – pedigree, looks, speed, class, and stamina. Following his championship 2-year-old season, Easy Goer had jaws dropping at Aqueduct when he cantered home in the Gotham Stakes, winning by 13 lengths and missing Dr. Fager’s sacred world-record mile of 1:32 1/5 by a fifth of a second. Easy Goer’s defeat in the Kentucky Derby to Sunday Silence was a bitter disappointment to McGaughey, who doubted he would ever bring a horse to the Derby with the God-given talent of the son of Alydar. In 1997, Ogden Phipps and McGaughey looked to have another big shot at their first Derby with the late-running Accelerator, who had finished a fast-closing second behind Derby favorite Captain Bodgit in the Wood Memorial. But one week before the Derby, Accelerator pulled up lame during a workout at Churchill Downs, suffering a cannon bone fracture. It was another crushing blow and neither Ogden nor Dinny would be back until this year. The Janneys have maintained that same philosophy of not running in the Derby unless they had a good chance and if it was in the best interest of the horse. In a move you would rarely, if ever, see today, Stuart Janney III and McGaughey teamed up in 1998 to win the Wood Memorial (gr. I) with Coronado’s Quest, who came within a fifth of a second of Private Terms’ record. But win or lose, the Derby was not under consideration, due to the colt’s immaturity and wild and crazy antics at Gulfstream Park that winter, which seemed to disappear once surgery was performed to free an entrapped epiglottis. By showing patience and giving him extra time, they were rewarded with victories in the Dwyer, Haskell, and Travers. So, one could easily see why the Derby gods would be inclined to smile down on Janney, the Phippses, and McGaughey this year, just as they did with Frances Genter, Paul Mellon and Mack Miller, William T. Young, W. Cal Partee, Charlie Whittingham, Robert and Beverly Lewis, Jerry and Ann Moss, James Tafel, and other owners and trainers who had demonstrated the class and sportsmanship that have always exemplified the spirit of Thoroughbred racing. As for Orb, he was broken and received his early training at Niall Brennan’s farm in Ocala, Fla. Among the other 2-year-olds there at the time were Revolutionary and Palace Malice, both of whom would also compete in the Kentucky Derby. For most of the winter, the Derby trail was all about the powerhouse arsenals of Todd Pletcher in the East and Bob Baffert in the West. Baffert’s big horses kept falling off the trail until he was left with not a single round of ammunition by Derby Day. Pletcher, on the other hand, lost his two Derby favorites, Shanghai Bobby and Violence, but still managed to get five horses there – Wood Memorial (gr. I) and Tampa Bay Derby (gr. II) winner Verrazano, Louisiana Derby (gr. II) winner Revolutionary, Arkansas Derby (gr. I) winner Overanalyze, and Palace Malice and Charming Kitten, the two-three finishers of the Toyota Blue Grass Stakes (gr. I). Last year’s Derby-winning trainer Doug O’Neill was back with Santa Anita Derby (gr. 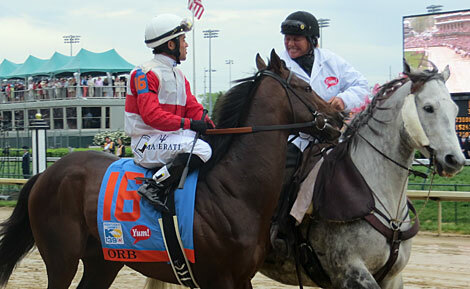 I) winner Goldencents, and four-time Derby winner D. Wayne Lukas had stakes winners Oxbow and Will Take Charge. Other contenders included Wood Memorial runner-up Normandy Invasion, Blue Grass winner Java’s War, and Louisiana Derby runner-up Mylute. 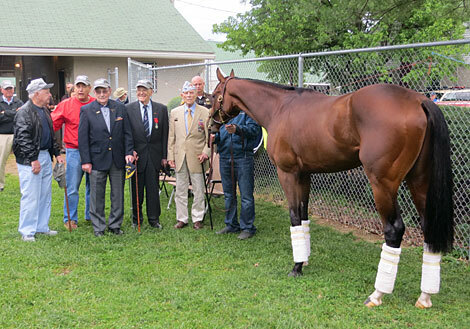 When McGaughey shipped Orb to Churchill Downs, he loved what he saw right from the start. In his second morning there, the colt was feeling so good, McGaughey asked Patterson if he was playing or if there was something wrong with him, She assured him he was only playing. Each day he became more settled and his gallops got stronger. “This horse is a bit of a throwback to more of an old-time horse,” McGaughey said outside his familiar Barn 43, where he always stables. “There’s nothing in his family that’s ever been a sales horse where they tried to make them bulky and speedy-looking in order to do well at the sales. I was amazed how this horse changed mentally and physically between the Fountain of Youth and Florida Derby. McGaughey said that he was happy to see Janney and Phipps enjoying the ride, and looked forward to bring them their long-awaited Derby. The universal feeling around the backstretch was the rooting interest for McGaughey, who is one of the most respected trainers in the game, and whose methods are applauded by racetrackers everywhere. But first there was the colt’s final work to get through. McGaughey still has vivid memories of Accelerator’s final work, in which he was pulled up on the turn, missing the Derby. All Orb did in his work was increase McGaughey’s confidence level, breezing a half in company in :47 4/5 and doing it with smooth, effortless strides, pulling well clear of his workmate. McGaughey was thrilled. Derby Week, however, always provides plenty of anxiety, and there was enough to go around for McGaughey and his wife Alison, as they sat at the post position draw and watched most of the desirable posts get taken, while posts 1, 2, and 3, where they did not want to wind up, were still open. Finally came the pill pull for No. 16 followed by the name Orb. Allison broke out in a smile, while a relieved McGaughey just nodded his head in approval. That was it; the final obstacle had been cleared. All that was left now was the waiting. Not even the ominous weather forecast seemed to dampen McGaughey’s spirits. It was time for the dream to become reality. Another set of events that had been playing out was on the jockey front, which saw Orb’s rider John Velazquez choose to ride Verrazano in the Derby. McGaughey understood that Velazquez had an allegiance to Pletcher, but he needed a rider, and that is where another important piece of the puzzle came together perfectly. Because McGaughey was so hesitant about running, he freed Anderson to get another mount for the Fountain of Youth, so he signed on to ride Speak Logistics. McGaughey then decided at the last minute to run in the Fountain of Youth, and the colt surprised him by winning impressively with Velazquez aboard, and then kept progressing, winning the Florida Derby. By losing the mount on Orb, Rosario was free to ride Animal Kingdom in the $10 million Dubai World Cup (UAE-I) the same day as the Florida Derby, which he won easily. When Velazquez jumped off Orb to ride Verrazano in the Kentucky Derby, Rosario was given the mount back. But instead of winning $1.4 million purses in the Fountain of Youth and Florida Derby, he won $10 million in purses in Dubai and wound up right back on Orb for the Kentucky Derby. 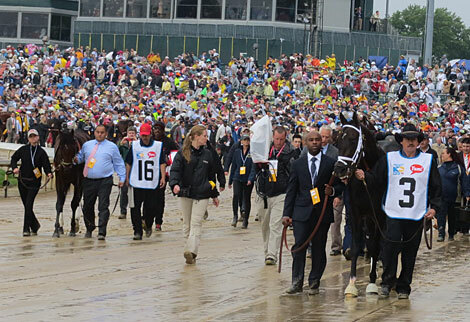 The projected rain on Derby Day came as expected, turning the track sloppy. 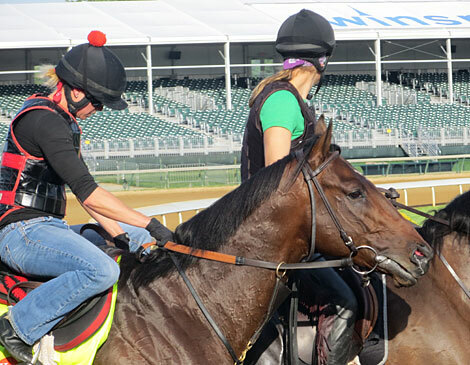 In a surprise move, Palace Malice, equipped with blinkers, outran all the expected speed horses and opened a three-length lead, while setting blazing fractions of :22.57 and :45.33. Goldencents, Falling Sky, and Verrazano took up the chase, but in the end, the blistering pace would cook all four horses, who would retreat quickly to finish at the back of the pack. Rosario, meanwhile, took Orb well off the pace and had only two horses beat down the backstretch, while trailing by nearly 20 lengths. Back there with him were Golden Soul, Revolutionary, and Mylute, all of whom would take advantage of the suicidal pace and finish strongly down the stretch. As they continued down the backstretch, Oxbow made a strong run along the rail to move into second. Around the far turn after three-quarters in a gut-wrenching 1:09.30, Palace Malice began shortening stride after setting the fastest fractions in Derby history on a wet track. Verrazano and Falling Sky called it quits as Normandy Invasion, under Javier Castellano, made a big move on the outside and surged to the front nearing the quarter pole in an attempt to run everyone off their feet and get the jump on the closers. For a brief instant, it looked as if Normandy Invasion was home free until Orb came flying around horses without a straw in his path out near the middle of the track to reach contention. Golden Soul was on the move behind him, and Calvin Borel, as usual, was hugging the rail with Revolutionary, who was picking off horses as well, occasionally having to idle briefly waiting for an opening. But down the stretch, it was obvious Normandy Invasion wasn’t sustaining his move and Orb was the strong horse, as he collared Normandy Invasion at the eighth pole and began to draw clear. Rosario had merely been hand-riding the colt, throwing a couple of crosses. But Orb has shown a tendency to start relaxing a little once he gets the lead, so Rosario roused him with a couple of left-handed whips. He was never in any danger of getting caught, but behind him there was a furious battle for second. Golden Soul kept on relentlessly to get second, a length ahead of Revolutionary, who was a head in front of Normandy Invasion, who in turn finished head in front of a fast-closing Mylute. There was gap of six lengths back to sixth-place finisher Oxbow, who was the only horse in the first five early to finish in the first half of the field. The final time for the 1 1/4 miles was 2:02.89. Stuart Dillender, who has worked on and off for McGaughey as foreman for 30 years, has been waiting for this moment a long time. Back at the barn that night, McGaughey arrived and hugged Patterson, who has devoted so much of her time to Orb. “You’ll never know how much we appreciate all you’ve done for us.” said McGaughey, who paid tribute to all his help. Kentucky Derby 139 will be remembered as the race in which the old timers rejoiced in the memory of how the sport used to be in simpler times, while the younger generation got a rare opportunity to enter a portal of time to witness something they may never see again. Longtime veterinarian Mark Cheney, who has done work for McGaughey for 30 years and has been close to Orb all year, was flushed with pride and excitement, and there was only one remedy for that, and that was a good stiff drink with an old friend. Orb and Jen Patterson heading out for one of their final gallops. Shug McGaughey checks out Orb one last time on Derby morning. Orb (left) and Revolutionary lead the walkover. They would finish 1.3. Orb is ready for action. Orb is taken to the back of the pack by Joel Rosario. 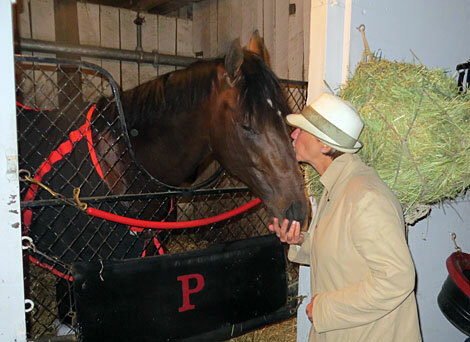 Alison McGaughey plants a kiss on Orb following the Derby.